The Ultimate Beginners Series gets aspiring musicians started immediately with classic acoustic rock and blues riffs, chord patterns and more. Now, for the first time ever, the UBS Basics, Acoustic Rock and Fingerpicking books are combined in one complete book and DVD set. Follow along with 4 hours of DVD instruction and 3 hours of audio tracks, with the help of on-screen graphics and printed diagrams. 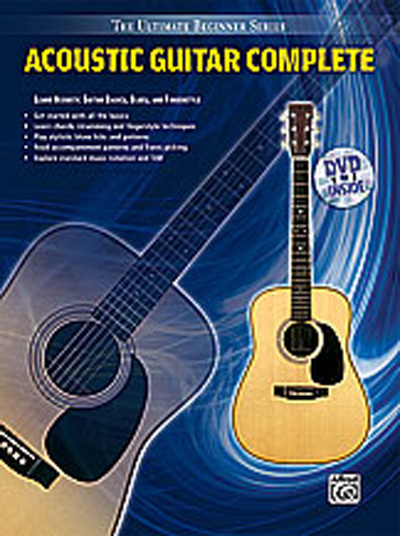 The Ultimate Beginners Series: Acoustic Guitar Complete will lead you from open position chords to licks. If you’re serious about mastering the blues and rock styles, this book and DVD set is a must-have.